Adventures in Scrapping: Sticking to a routine! I'm hoping that sticking to a routine for household and everyday life will allow me more time to play, with my kids, in my garden and in my craft room! Anyways, it was Kebab night.. my first test of my new themed menu.... I wanted to start simple, so I went with this Souvlaki Style Lamb, something the kids would all like (I hoped), that was easy to put together (it definitely was) and that would taste good (it did, but would be better overnight). I served it with coucous with peas and sauteed onions, tzatziki, and warmed pita bread. Everyone had their favourite part of the meal, but everyone ATE it... so that's a good thing. After dinner I decided to FINALLY finish this card that I have been working on for DAYS! It's not even that complicated, and in the end, I wish I had coloured the bear in as if he was a person, so more skin toned, but I wanted to FINISH something for a change. I got this High Hopes Stamp from a cute on-line store called Stamp and Create, which is run by Lacey Stephens. 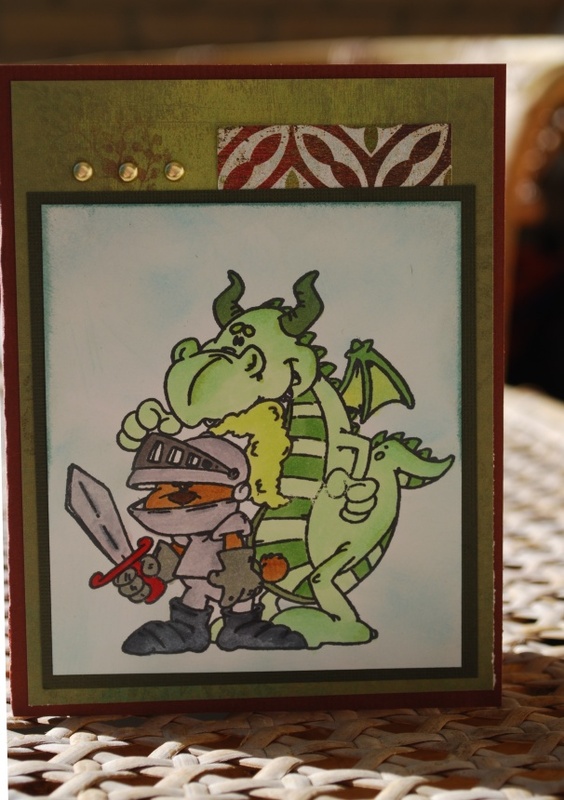 She's a GREAT cardmaker, has an excellent blog and runs a nice online store. I hadn't bought any stamps in a while so I treated myself a while back. I also ordered some charms and some Shimmerz Hadn't tried the Shimmerz until tonight, and I like it. I used the Silver Bells for the Knights armour, gives a nice sheen, but I wish it had been just a bit more transparent so the colour of the Copics would have shown through more... anyways, here it is... I think it's very "current" with all the How to Train your Dragon stuff that's out these days. Now, let's see if I can make a LAYOUT to share!